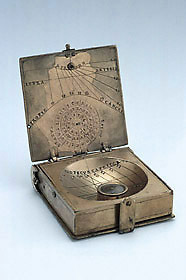 This is a relatively small and plain compendium, with only two sundials and a compass, as well as some astronomical tables. The instrument is in the form of a book, with a curved spine and a clasp. Although carrying no sign of maker or origin, the compendium's use of Italian hours and the Italian names of the winds suggest the attribution to Italy. In addition, one of the tables is based on a latitude of approximately 41?, close to that of Naples.